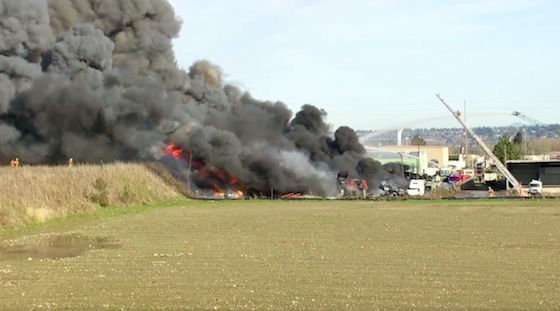 Residents in northeast Portland, OR, near an auto salvage yard that caught fire early Monday were ordered to immediately leave the area due to severely decreased air quality. People living from Northeast 60th to East 76th between Northeast Columbia and Northeast Alberta have been issued an evacuation notice while air quality monitors continue to pick up dangerous levels of fine particulate. East winds were expected to keep the dark, toxic smoke near the ground level until Tuesday morning. Multnomah County and the Red Cross opened up an emergency shelter for evacuees and their pets. According to a public health toxicologist with the Oregon Health Authority (OHA), the particles and gases emanating from the smoke are harmful for children, elderly and those with heart and/or lung problems. Airborne toxic chemicals from the smoke of burning tires include: Sulfur dioxide, asbestos, acid gases, benzene, styrene, metals and more. OHA said children, who on a normal basis breath in more air per minute than adults while also taking in more air in relation to their body size, are acutely sensitive to poor air quality. Elderly residents in the evacuation area who are experiencing adverse symptoms — coughing, wheezing, lightheadedness and/or unusual tiredness — are also advised to call their healthcare provider right away. Cause of the fire is still under investigation.